Loosely translating to “The House in the Sky,” this four-story, gulf-front property takes advantage of the seemingly infinite views that you can experience from the high-rising luxury home. Casa de Cielo is a 4,300 square foot, 4 bedroom, 4 full and 2 half bath, private home in the highly sought after gated community of Destiny by the Sea. 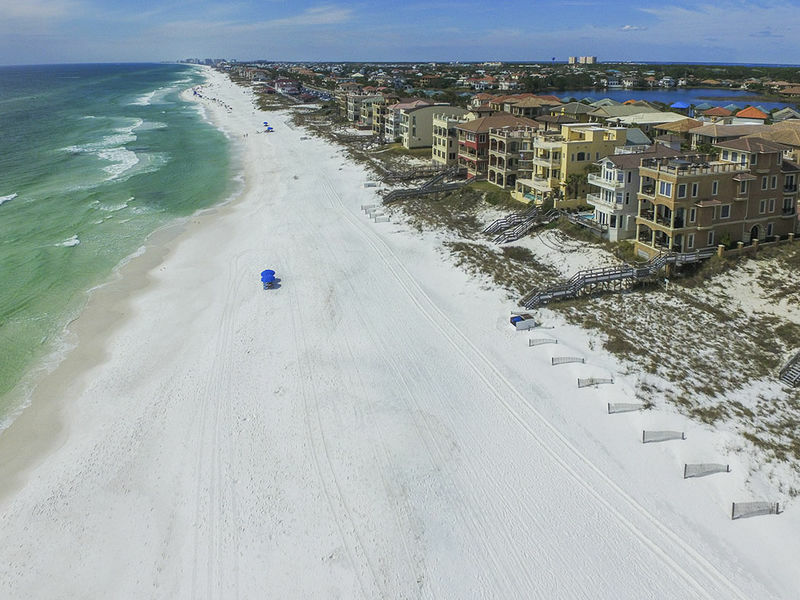 With four Master Suites, a private movie theater with stadium seating, an in-home elevator, and a rooftop deck, Casa de Cielo is a home custom built to take in the marvels of the Destin area. Guests will be greeted to the home by a private movie theater with stadium seating, a 120-inch projection screen, surround sound, a DVD collection, and a wet bar. The wet bar has a popcorn maker, a mini-fridge, and an icemaker. Also located on the first floor is the first of four Master Suites. The first floor Master has a King bed, a walk-in closet, private porch access, and a private Master Bath. The Master Bath is complete with dual sinks, a stand-alone shower with a bench, and a private water closet. The second floor houses an open living area with stellar Gulf views. The living room seats six and includes a fireplace, a large LG flat screen TV, a DVD player, and a wet bar with an ice maker and a mini-fridge. The formal dining area has seating for eight, with additional seating for three available at barstools along the kitchen counter. The Kitchen has Thermador appliances, a small flat screen TV, granite countertops, a wine holder, two blenders, and two coffee makers. Just off the kitchen you will find a wine cellar. You will also find the home’s second Master Suite on the second floor. The second floor Master features a King bed, a flat screen TV, a DVD player, and a private Master Bath. The Master Bath has a stand-alone shower with a bench, a separate tub, a private water closet, and a dual sinks. Also located on the second floor, just off the kitchen and dining area is a half bath. The third floor plays host to two more Master Suites. The first third floor Master has a King bed, a flat screen TV, and a Master Bath. The Master Bath is complete with a stand-alone shower, a tub, dual sinks, and a private water closet. The second Master Suite on the third floor is the largest of the four Masters. Through a long hallway with columns spanning the walls and an arched ceiling, this suite is as large as it is luxurious. The suite features a King bed, a flat screen TV, a private porch with Gulf views and seating, and a wet bar with a mini-fridge/icemaker. The Master Bath off this Suite features a large rain head shower with a bench, his-and-her vanities, a jetted tub, a private water closet, and his-and-her walk-in closets. 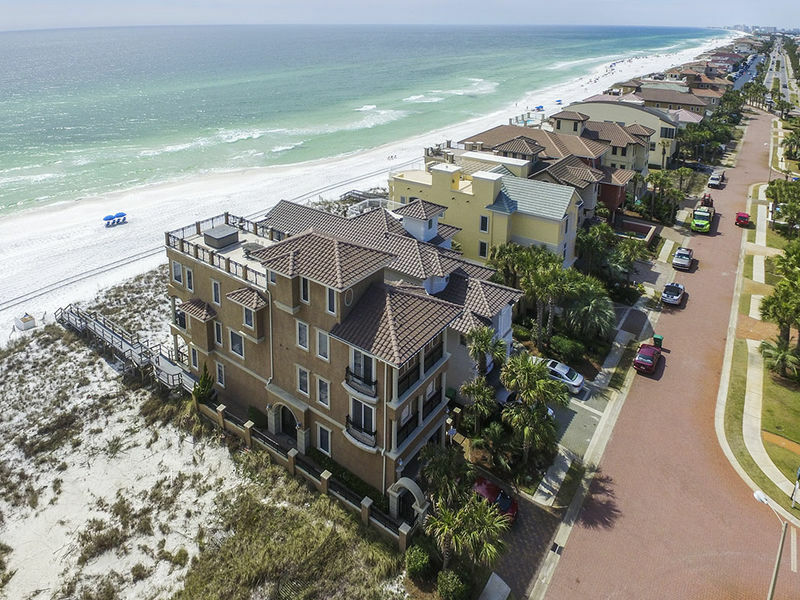 The first through the third floors are accessible by an in-home elevator, however, those willing to make the trip to the fourth floor will be rewarded by panoramic views of the jewel toned water of the Gulf and the surrounding area. The fourth floor hosts a bonus room with a sleeper-sofa seating three, a flat screen TV, a kitchenette, and a half bath. The kitchenette has an electric range, a microwave, a small sink, a fridge/freezer, and a small dishwasher. Through this bonus room you will find access to the rooftop deck area. With a hot tub, an outdoor shower, lounge chairs, and an al fresco dining area for seven, the rooftop deck offers some of the best views Destiny by the Sea has to offer. 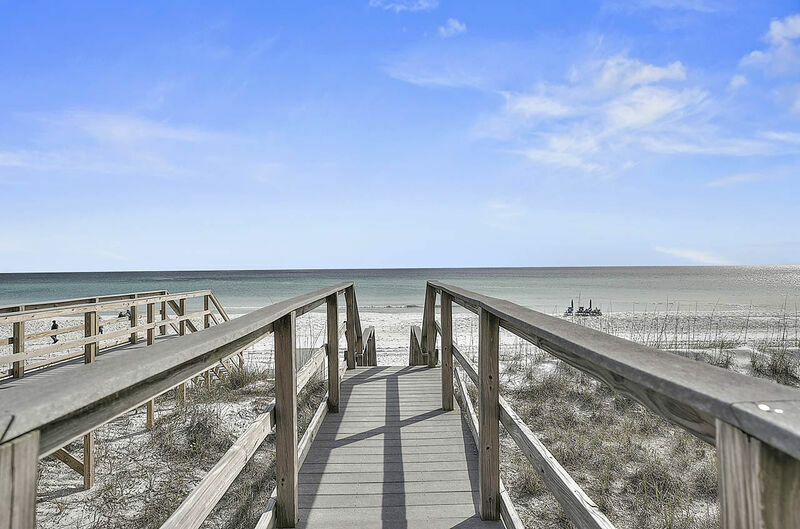 Casa de Cielo also features private beach access on one of the nicest stretches of beach, right between Frangista beach and Crystal Beach. In addition to all the amenities that the private home has to offer, you also have access to the community amenities. Destiny by the Sea boasts a large community pool, as well as a private beach. The community is marveled at for both its massive luxury properties, and the privacy provided within its gates. 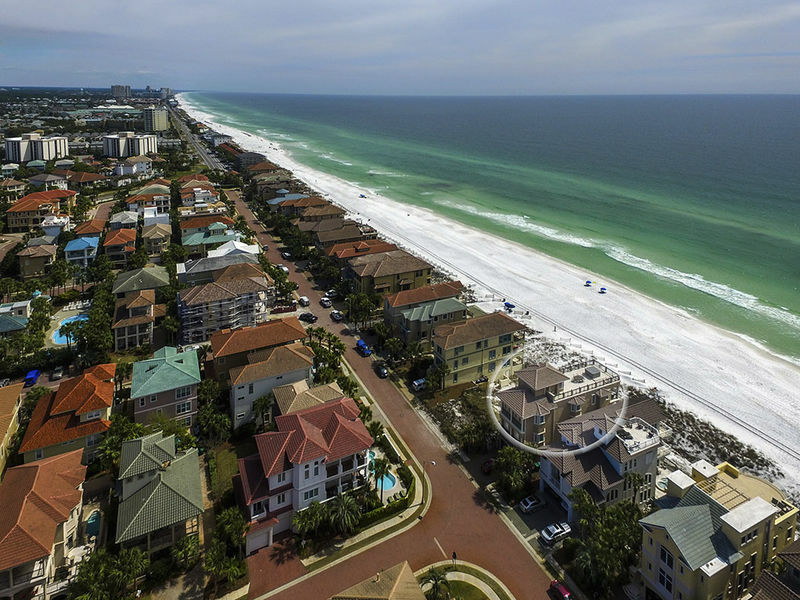 The community is known for being posh and quiet, and offering the best that Destin has to offer in terms of properties and views.